On July 4, 1965, a group of courageous gay and lesbian activists from New York, Washington, D.C., and Philadelphia laid the foundation for the organized LGBT civil rights movement with demonstrations in front of Independence Hall. Known as "Annual Reminders," these protests of East Coast Homophile Organizations (ECHO) occurred every Fourth of July from 1965 to 1969. In 2015 we proudly commemorate the 50th anniversary of the Annual Reminders, the Gay Pioneers who staged them, and a half century of LGBT civil right progress. In the 1960s, there were approximately 200 gay activists in the nation. 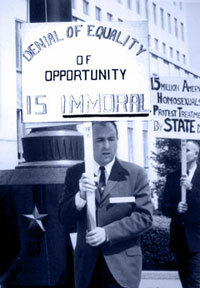 There were protests in late 1964 and early 1965 in Washington, D.C., and in New York about an individual issue, such as Fidel Castro rounding up homosexuals, the Civil Service Commission’s prohibition against the federal government employing gay or lesbian Americans, or military discharges. They were not tied to a specific event. In 1965 it was the first time demonstrators demanded equality for homosexuals. In 1965 when 40 activists picketed, it was the largest demonstration for gay rights in world history. The protests were a collaboration of the East Coast Homophile Organizations (ECHO). Gay men and lesbians from Washington, D.C., Philadelphia and New York participated. It was the first time activists from more than one city came together in protest. Held each July 4th from 1965 to 1969, the Annual Reminders were the movement’s first sustained gay rights demonstrations. Frank Kameny and Barbara Gittings, the father and mother of the organized LGBT civil rights movement, were the principal organizers. The Annual Reminders were planned strategically on Independence Day at Independence Hall, where the Liberty Bell then resided, and where the Declaration of Independence and the Constitution were written—documents that proclaimed the right to life, liberty and the pursuit of happiness, and equality. The Liberty Bell was adopted as a logo by abolitionists and, later, by suffragettes. The Liberty Bell linked the Gay Pioneers' aspirations with the black and women’s civil rights movements. In 1969 when the Stonewall riot occurred, the Gay Pioneers recognized it as the movement’s Boston Tea Party. Leaders suspended the Annual Reminders to help organize a march from Greenwich Village to Central Park, marking the first anniversary of Stonewall. The march is now remembered as the first New York Pride Parade.